7 October 2016 - 22 January 2017. HAM Helsinki Art Museum finishes up the year 2016 with a retrospective of Japanese artist Yayoi Kusama (b. 1929), one of the leading artists in the world today. The exhibition consists of her most notable works, including paintings, sculptures and installations. The exhibition covers Kusama’s work from her early career in the 1940s to the present. Comprising more than 200 pieces, the exhibition includes paintings, drawings, sculptures, videos and installations as well as materials relating to Kusama’s performances. 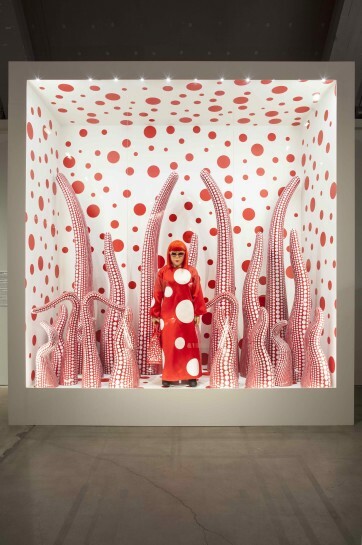 In Infinity is also highlights Kusama’s relation with fashion and design. It includes works that have now been displayed for the first time ever – and also works produced for this particular exhibition. The exhibition is organised by the Louisiana Museum of Modern Art in cooperation with Henie-Onstad Kunstsenter, Moderna Museet/ArkDes and Helsinki Art Museum HAM.